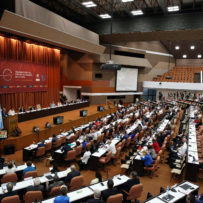 The 37th Session of the Economic Commission for Latin America and the Caribbean (ECLAC) is taking place from 7 – 11 May in Havana, Cuba. The event, which takes place biennially, is the most important intergovernmental conference for steering the work of ECLAC. It serves as a forum to discuss critical economic and social development issues in the region, and is also an occasion for member States to review the Commission work. At the 2018 session, ECLAC will present its 2016-2017 progress report and member States will contribute to defining the mandates that will guide the Commission’s work in the future. ECLAC will also present The Inefficiency of Inequality, its new report which highlights the need for governments and other stakeholders to stop and reverse inequality in Latin America and the Caribbean. The report draws out specific themes, including what it calls a “culture of privilege” and a need to shift towards a culture of human rights. Learn more by visiting the 37th Session’s website where you can find background documents including the agenda, reports for previous ECLAC Sessions and news.